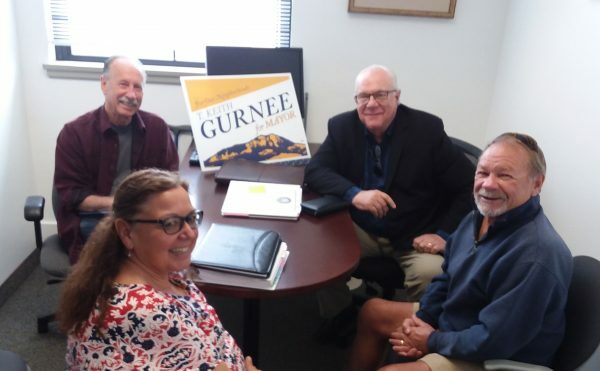 Taking out papers at the SLO City Clerk’s office with campaign Treasurer Mike Clark, City Clerk Teresa Purrington, Keith Gurnee, and Campaign Co-Chair Terry Connor. As a long-time resident of San Luis Obispo, I cannot recall a time when we’ve had a mayor and city council so out-of-touch with its citizens. Once considered the “Happiest Place in North America,” San Luis Obispo is anything but happy these days. Back in 2016, Heidi Harmon was elected by the slimmest of margins over previous Mayor Jan Marx. Many chalked up her surprise victory to the community’s fatigue with the prior mayor. For that reason, many voted for her without knowing where Harmon stood on the issues. Since then, Harmon has governed as something of a political gadfly, out to change the world by advocating radical changes to one of the finest, high-quality small towns in California. Having talked with many of those who voted for her in 2016, they now regret their choice and are looking for an alternative. As the first and last Cal Poly student ever elected to the San Luis Obispo City Council, I served in that capacity for 6 ½ years and accomplished much during my tenure. Since then, I have enjoyed a long career as a professional planner and urban designer with extensive experience working with local governments. As such, I am presenting myself as the type of experienced candidate that voters are looking for. Actually listen to our residents. 2. Protect our historic neighborhoods. 3. Hold Cal Poly accountable for its impacts upon our community. 4. Expand our greenbelt and carefully manage our natural resources. 5. Bring fiscal responsibility back to City Hall. 6. Represent all residents of the community rather than just an ideological few. 7. Strengthen our downtown in keeping with its scale, character, and heritage. 8. Bring to the table an extensive body of experience in urban planning and design. 9. Govern with competence and compassion. 10. Provide a vision that respects the high quality of life for which San Luis Obispo has long been known. Come Nov. 6, hopefully voters will agree that we need a vision for making serious changes in our city’s governance. It’s time to bring common sense and balance back to City Hall and to do things with and for our neighborhoods rather than to them. As your mayor, I pledge to do just that. Together, with your support, we can do this…for our neighborhoods! Keith presents such a sound voice – one borne out of experience and ‘in the trenches’ with SLO city government that I can only hope people wake up and get out and cast their vote for him. There’s still an opportunity to reverse the disastrous course this current council has been taking. Keith, thanks for stepping up to this outsized task. Heidi Harmon is an awful mayor. You have pretty much anybody with a brains support.